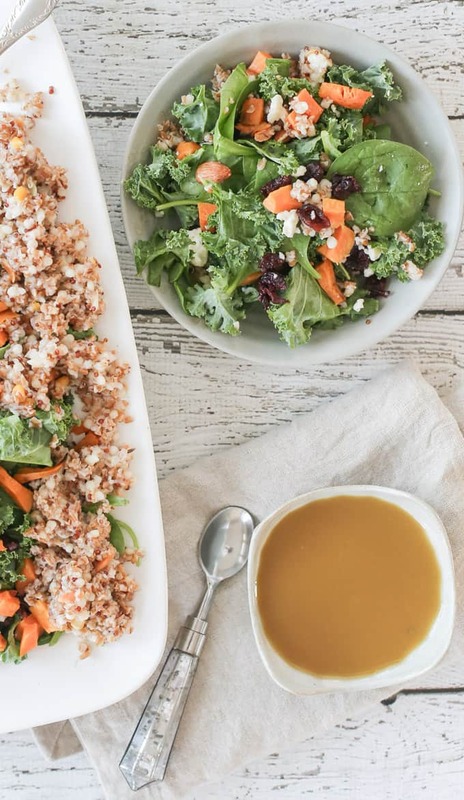 I had a really hard time naming this quinoa and kale salad with cranberries. 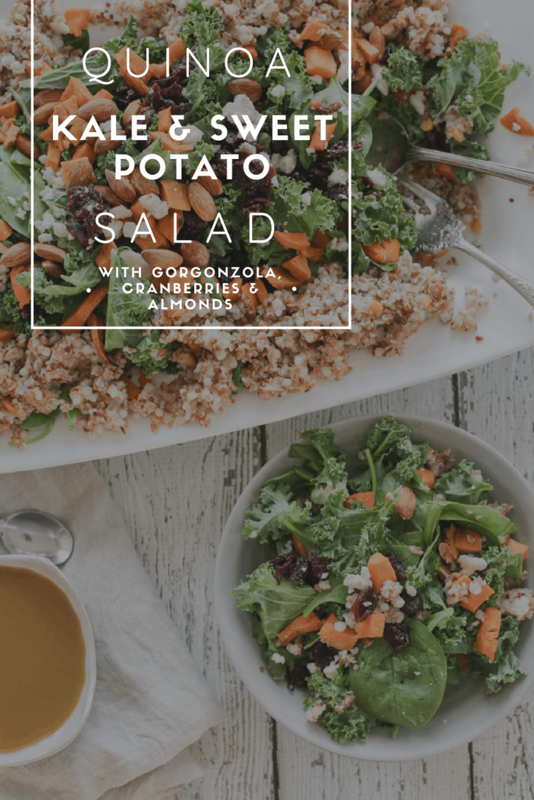 I played around with several names: Bulgur Kale Salad or Bulgur + Roasted Sweet Potato Salad or Kale, Spinach + Cranberry salad. 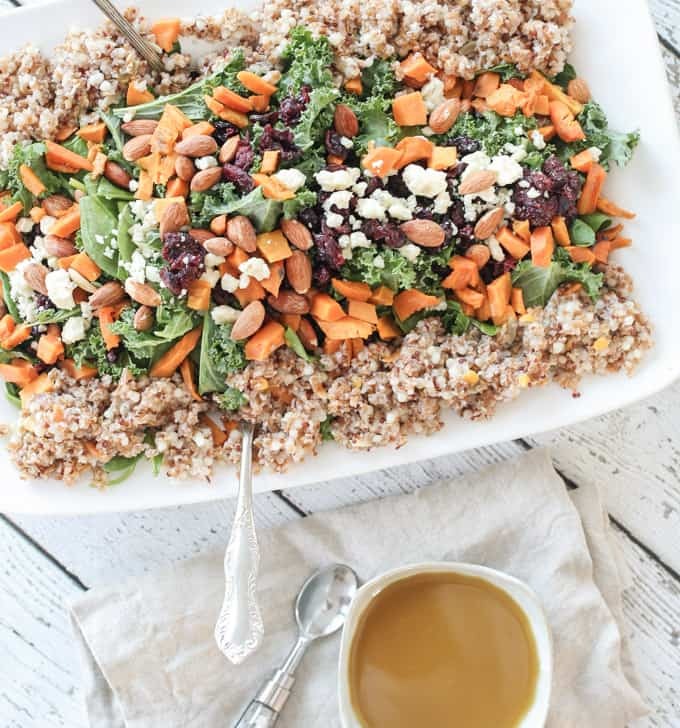 And how about the dressing – Sweet + Tangy Tahini? Sweet Garlic? Tangy Honey + Sesame? Seriously….it was a tough choice because there are just so many great ingredients in it. 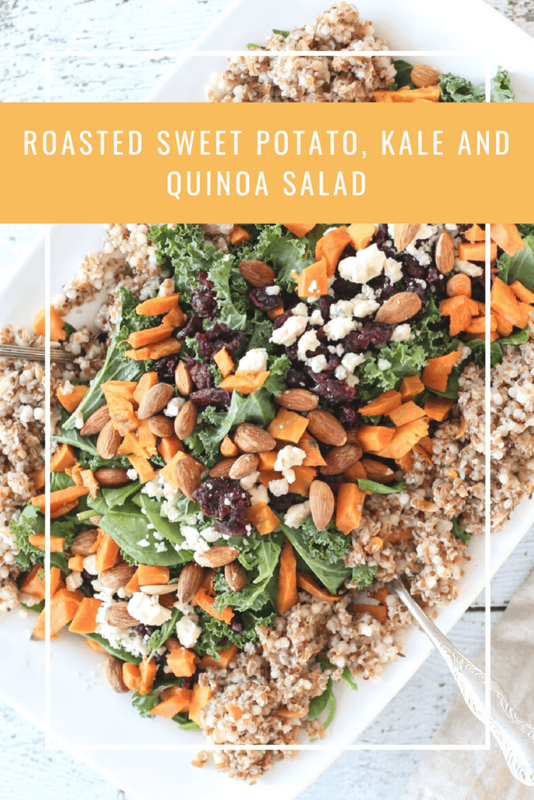 But like most loaded salads, this salad is amazing, bursting with flavor and is actually inspired by a similar salad I tried at Trader Joes. 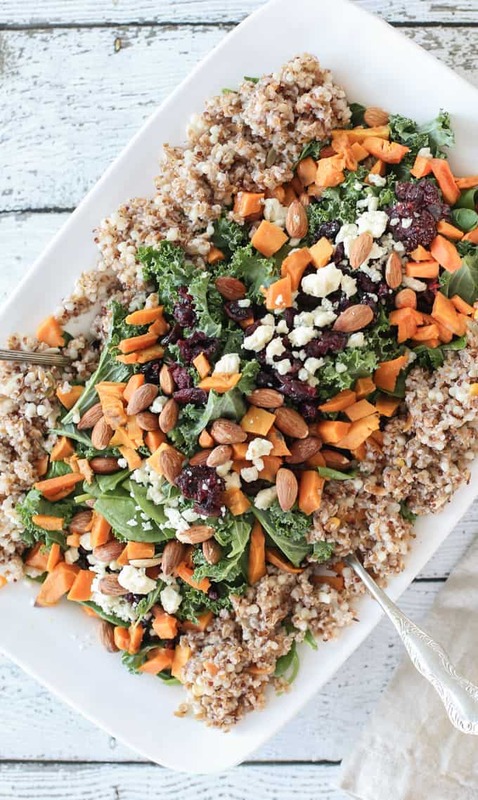 While the Trader Joes salad had roasted red peppers, wheat berries, butternut squash and goat cheese, this salad is created with quinoa, roasted sweet potatoes, gorgonzola and almonds. I made a tasty sweet garlicky tahini dressing to alongside of it. 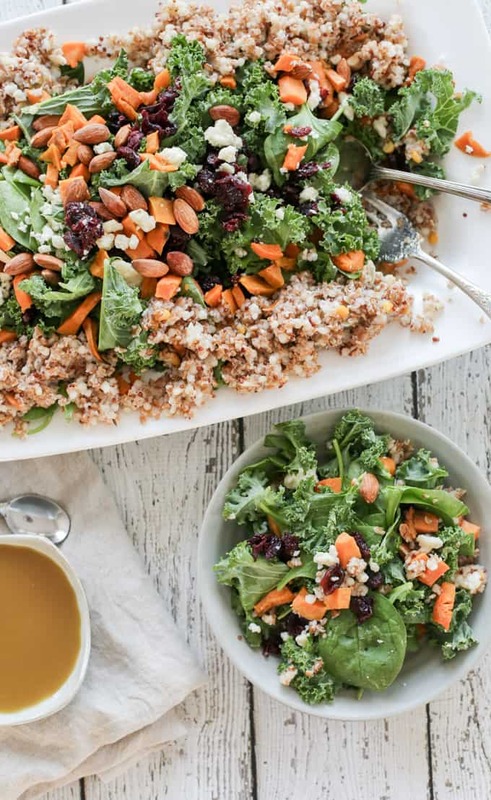 And because it’s fairly low in fat and is so hearty, this quinoa and kale salad with cranberries can be eaten as a meal as a great vegetarian option or a meatless night. Mix kale and spinach together and arrange on a serving plate. 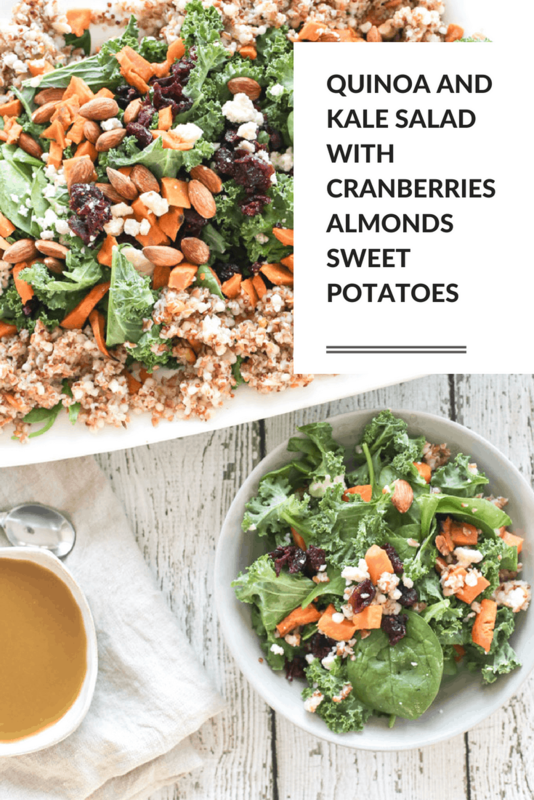 Sprinkle roasted sweet potatoes, cheese, cranberries and almonds over kale/spinach. Place bulgur and quinoa on the edges of the serving plate. In a small bowl, mix together dressing ingredients and whisk well. Serve salad with dressing. *Tahini is a sesame paste that can be found in in the organic section or the international section of the grocery store. Love a good, hearty salad like this that can constitute as a meal! Looks so pretty and colorful! I love the salads from Trader Joe’s! And boy do I hear you on recipe naming. Most of it is determined by how much I can fit on one line! haha – such a silly way! TJ’s salads are seriously the best. Haha thanks! It’s always so difficult. This looks wonderful. I’ve been trying to find more substantial dinner salads (as in the salad is the main course) and I think this would be perfect. This is definitely substantial. If you do end up trying it, you’ll have to let me know what you think.